Today marks 100 years since the suffragette women earned the right to vote through their courageous and brave actions. As this movement is at the forefront of our minds I thought it fitting to write a little piece on Suffragette jewellery. I have come across a few pieces of Suffragette Jewellery (although not many as such pieces are rare) during my many trips to Antique fairs across the country. I thought writing this short piece would be good way for me to gain a little more knowledge on this topic as hey it never hurts to build ones expertise. Through some research I have discovered that suffragette jewellery was worn by supporters of the Suffragette movement (circa 1908). Suffragette jewellery and medals were worn as a political statement. Suffragette memorabilia and jewellery is highly sought after today and its desirability has peaked in light of all the media coverage in the build up to the 100 year anniversary of this amazing moment in our history. We have recently seen the film Suffragette starring Meryl Streep where she is filmed wearing the now well recognised Holloway Brooch (this I shall come to later). The Suffragette color scheme which can be seen in much of the jewellery is green, white and violet. Suffragettes used these colors to represent who they were. The colors were no secret. The colors stood for the phrase: Give Women the Vote. The high end London jeweller and silversmith Mappin & Webb dedicated a whole double page spread of their 1908 Christmas catalogue to Suffragette jewellery which was seen as quite a bold move at the time as to be seen wearing or promoting such colors was controversial. With the outbreak of the First World War wearing Suffragette jewelry was seen as unpatriotic. The Womens Social & Political Union (WSPU) was a well-recognised Suffragette group who felt that the colors represented nobility, purity and hope. The colors are symbolic. Purple is the Royal color also known as regal blood and would be represented by an Amethyst stone. The color white was represented by Pearls and was signified as purity. Lastly, the color green was represented by either Emeralds, Peridot or Tourmalines. You cannot research Suffragette jewelery without coming across the Holloway brooch. The Holloway Brooch or medal was awarded to Suffragettes who had been incarcerated as a result of their Suffragette protests. The Holloway Brooch was designed by Sylvia Pankhurst. Sylvia Pankhurst was a recognised Suffragette leader and artist. Pankhurst was imprisoned in Holloway were she endured sleep, hunger and thirst strikes. Sylvia Pankhurst designed the Holloway Brooch so that Suffragettes were recognised as political prisoners. The Holloway brooch is recognisable by the convicts arrow in the Suffragette colors of purple, white and green. The convicts arrow was set against the Portcullis symbol of the House of Commons. It has to be pointed out that there is a lot of so called Suffragette jewellery about with the symbolic colors but whether it can be directly attributed to this movement is often questionable. There is much debate in the trade as to what warrants as a genuine piece of Suffragtte jewelry can actually be directly attribute to somebody wearing such a piece back in the day. Often if the piece does not have a makers stamp or does not come with a certificate of authentication collectors will not see the jewellery as a valid Suffragette article. A genuine Edwardian piece of jewellery would command a large sum of money. 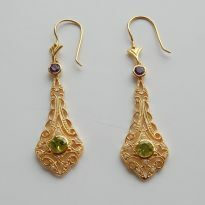 In the accompanying photograph to this article I display a later reproduction pair of earrings bearing the Suffragtete colors which are represented by the Pearl, Peridot and Amethyst accents on a stunning filigree frame. Although not an original Suffragette piece it is still a beautiful example of what you should be looking for when on the look out for such pieces!